Five years after his death HRF Keating sprang a surprise. A major novel, written in 1987 but never submitted for publication. 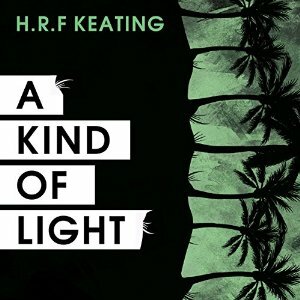 “A Kind of Light” is available as an original audio book to download from www.audible.co.uk. HRF (Harry) Keating’s dialogue and strong characterisations have always made his books ideal for reading aloud and this book with its African Jungle setting is no exception. The majority of his books have been recorded after they have been first published in print. “A Kind of Light” is a rarity in reversing the order – audio first before any other print form. Harry would certainly have approved because he was a great advocate of the spoken word. “When I began reading, I was doubtful that ‘one of the dark places of the earth’ could lend itself to ‘A Kind of Light ‘, but Harry Keating borrows skilfully from Conrad and repays the loan with interest. The device of the documentary film crew retracing the steps of Thomasina the Victorian explorer and diarist cleverly lets us follow the journey, physical and emotional, of the constantly sparring protagonists David and Tom. The disparate cast of characters encountered as they travel deep into an alien environment allows for shrewd observations on the life choices we make.